Nominal new home prices plunge record -15.1% yr/yr to January yet sales plunge and inventories soar; durable goods orders also plunged in January. 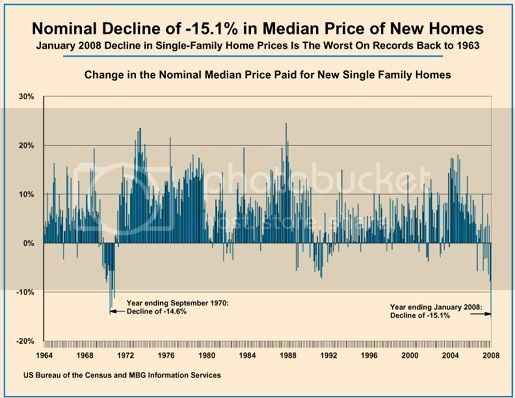 The key finding in today’s Census Bureau report on new single-family home sales in January is that the median nominal price plunged -15.1% yr/yr, the worst decline on record back to 1963. New home prices were down -7.8% in the year ending December 2007. 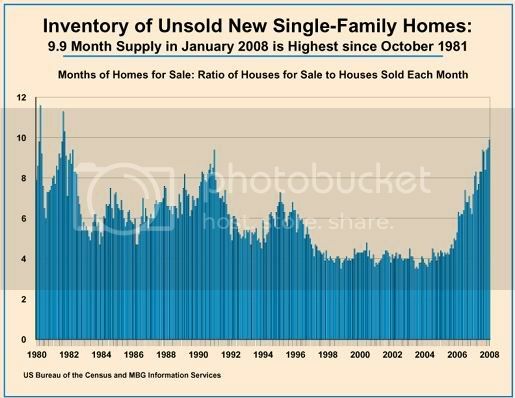 Also very important is that the inventory of unsold new homes soared to a 9.9 month supply in January, the worst glut of empty new homes since October 1981. Unsold inventories represented a 9.5 month supply in December and a 7.2 month supply in January 2007.